I started studying the Bible when I was in my early twenties. I had been in Sunday school classes, Vacation Bible school, and church services but had never had an appetite for learning about God and the Bible. My interest peaked when I started growing up and realizing the responsibilities of being an adult. I was married, struggling financially much of the time, the few prayers I prayed were seemingly not being answered, and I was searching for truth. As I began to read long passages of Scripture, (even whole books of the Bible), and tried to understand what they really meant to me, I was shocked that at least some of what I had been taught was in my view not biblical. Later, after I entered Bible school for ministry training, I was also shocked that there were so many different views of what I considered to be important doctrines among the staff. It was there that I first was convinced that people of good will can have differing views of many things in the Bible and still work together for the greater good of Christ and the gospel. I learned that the gospel of Christ is truly of first importance, it is the watershed of Bible doctrine and everything else is somewhat less important. So it was that my training was a mixture of ideas, opinions, and traditions all of which were supported by the Bible according to those who taught them. We were Southern Baptists, we were “free will” people, with many of us coming from the Free Will Baptist perspective. My parents fit that description. Both of my parents were shaped by Free Will Baptist preachers from the hills of Western North Carolina. In their understanding of God and salvation there we many, many more ways to lose your salvation than to find it. By the time I was in my late 30’s my mother (who was blind) had been exposed to many, many hours of Bible teaching by a variety of teachers by way of radio. She was greatly influenced by J. Vernon McGee, and by her fairly new pastor, Rev. Kenneth Ridings, a great Bible man. My dad had been saved and was on fire for Jesus, and he too, had left some of the old teachings that he had learned in his earlier years. He had been baptized in his 20’s but it was pretty obvious to my mom and everyone who knew him that he really was born again much later in life. His passion was Jesus and telling others about him until he went to meet him in the late spring of 1993. I was in my late 50’s when I first started to grapple with what some refer to as “the doctrines of grace”, known more widely as Calvinsim, and more narrowly as “monergism”. It was not that I was reading writers who embraced the TULIP of Calvin, it was quite the opposite. I was reading my Bible and started to see dozens of texts that I usually either ignored or believed as I had been covertly taught, “they don’t mean what they say”. The more I studied and read the Bible the more I saw! I came to the place where I had to deal with those obvious truths, many of which were the opposite of what I had believed for decades and taught myself. It became clear to me that I was in a theological pickle, so to speak. I could not embrace the 5 points of Calvinism, at least the way I understood them. Neither could I any longer believe as some of my friends that election and predestination are “not true”. I was and am a member of great Church of Christ and trust me, “Reformed” or “Calvin” are ugly words in the minds of most Restoration people. Somewhere around my yearly 60’s, (I’ll be 68 this month) it all started to come together. My mountain of a problem had been that I was trying to find out which doctrine was right. I thought I must believe either the doctrines of grace, or be a full blown Armenian. I knew for sure I was not a true blue “free will” guy and I couldn’t buy all that the Reformed guys were saying, so I was “between a rock and a hard place’, as the saying goes”. I have said this many times before but I don’t believe people get it. My options as a Christian, as to the written revelation of God is not “either, or“! Christians are not given the liberty to pick and choose what parts of the Bible they will believe and live by. Our’s is to try, the very best we can, with God’s help, to believe and live by ALL of the scriptures. Of course we must use the wisdom God gives to understand it in context, we can’t ignore the widely accepted methods of biblical interpretation. When dealing with complex and difficult differences in the Bible there is a better option than “either, or”. The far better option is “both, and“. If it is in the Bible it is true! I now have peace about what I was finding in Scripture because I just believe it! Does God bring men to himself and open their understanding and cause them to repent and trust Jesus? Yes! Is man required to repent, and does he have the freedom to say yes or to reject? Yes! The Bible emphatically teaches both, and both are true. So let’s just believe what God says and let him be God! God is absolutely sovereign, but his sovereignty never functions in Scripture to reduce human responsibility. Human beings are responsible creatures—that is, they choose, they believe, they disobey, they respond, and there is moral significance in their choices; but human responsibility never functions in Scripture to diminish God’s sovereignty or to make God absolutely contingent. I agree! I was mowing my lawn today as I thought about these things and it dawned on me that most of us believe as Carson does to some degree. We hold that a sinner is required to repent and that he has the God given free will to choose to follow Jesus, to come to faith and be baptized. All very true. But, why do we pray for him to come to God? If we don’t on some level believe that God can move a man toward repentance and faith, why pray? If we ask God to change the person’s will are we not admitting that God can change it? I believe that almost all of us who are Christians would agree that we would not be believers today except for the work of God in our lives. When Jesus said to those rough cut fishermen and others who would be his inner circle, “Follow me”, could they have refused? Yes. But it’s a big deal to me that they didn’t. Why are churches of Christ in decline? that is in steady decline. The largest evangelical denomination, Southern Baptists, are too in decline with a several year drop in baptisms year after year. However, there is little comfort in the fact we are not alone. I doubt that a person just diagnosed with cancer is comforted when he finds that several others have it too. In the past several months there have been dozens of blogs and other articles addressing the decline of evangelical church membership and several have been particularly focused on churches of Christ. So I’ll add one more voice to the chorus of voices concerning the downward spiral of our churches and the people who attend them. The volume of blog posts, magazine articles, books and lectures that suggest reasons and solutions is huge. Should our churches be more user-friendly? Is allowing parishioners to “dress down” on Sunday morning one of the pieces of the puzzle. Maybe a better, more attractive website will help. Will a praise team, or even a band position us to better appeal to young people? Is our lack of community service the missing link? If we begin in earnest to “serve” our community, will that attract more members? And of course, a slick Power Point presentation must accompany every Sunday sermon. Everyone knows that! Maybe we should find what unchurched people find appealing and provide that. After all isn’t our mission to address their needs? In the last few weeks I have surveyed hundreds of church websites to try to get a feel for what Sunday sermons are focused on. And, just last night I scanned perhaps two hundred sermon topics listed in various church “Gospel Meeting” announcements and past meetings. And guess what I learned? Of all the “Gospel Meeting” lesson topics, of scores and scores, I found 4 or 5 that might have been focused on the good news about Jesus and what he accomplished for sinners. Oh, there were good things to be sure. Most were lessons on marriage, rearing children, the importance of the Bible, the church, and much about ethics and morality. Unity, elders, Restoration history, and others also got a lot of coverage. Sunday sermons covered most of those same topics but primarily focused on personal disciplines like prayer, Bible study, loving others, community service, giving, and many other noble and worthwhile subjects. I was both shocked and saddened when a few weeks ago I asked this question in a thread of comments on the popular One in Jesus blog, “What is the gospel?” Some of the answers were “The life and teachings of Jesus”, “The New Testament”, and at least one that in essence said, “If you are baptized and live good enough you will be accepted by God”. There is only one reason why long time members of churches of Christ don’t know what the “gospel” is, they have not been taught it. A cursory mention of the death, burial, and resurrection of Jesus, or getting agreement that Jesus was the son of God cannot be passed off as gospel teaching. In my view a person who almost never preaches the gospel should not allow people to call him a “gospel” preacher. Much of our history has been trying to get denominational people to accept our view of baptism and they way we do church on Sunday morning. 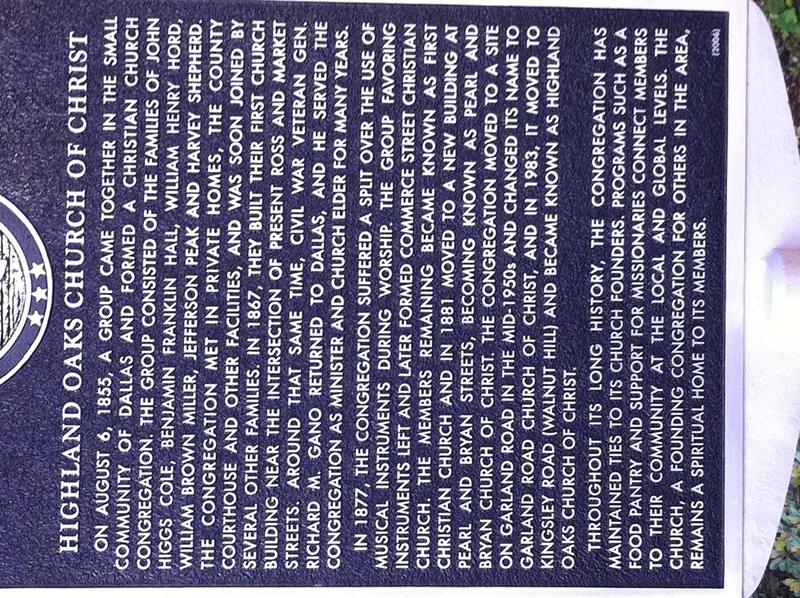 A long time coc missionary once told me that our historic mission had been “correctional” rather than redemptive. I later learned that he did not coin that statement but nonetheless it was very true. What people everywhere need is not to be reformed but reborn. Theistic moralism is not good news. Many of us have the flawed idea that if we can get people to attend church regularly and improve their morals they and others will be helped. Maybe so, but they might still perish having never known Jesus. Yet, most of our teaching is don’t do these things but do these things. Pray more, study your Bible more, give more, love your wife more, spend quality time with your children, teach your children to love God and to be obedient, do acts of kindness, etc., etc. All of these are good but not best. A dead man does not need a better suit of clothes, or a better hair do, he needs life and there is only one place to get it. I have had many sales jobs and was not very good at most of them. The ones where I did best were the ones with the best training. I once sold Bibles door to door in the hills and hollers of rural Western North Carolina. When I knocked on a door I knew exactly what to say and when to say it. After my 3 or 4 minute presentation the person bought my Bible or likely felt guilty for not loving God and his Word. It was a slick presentation that highlighted the features of the Bible and then put a guilt trip on the person as motivation to buy. I don’t feel very good about that chapter of my young life but I did it. A few years ago a church in a distant city (without being invited by anyone) decided that they would conduct a door knocking campaign in a small town to help the new coc there grow. In discussions with the leader of that group I learned quickly that the goal was to establish a church of Christ in the community. They did knock on doors and after a few days baptized I think 16 people. They were elated! Of those 16 people who were baptized I think perhaps about three of them ever attended a church service and even those didn’t stick around long. They were no more saved than a goose. I was once asked to speak to a young man who wanted to be baptized. I asked him “Why do you want to be baptized?”. He replied “I want a better life”. I explained to him that baptism would not give him that result. I carefully told him the good news about Jesus, why Jesus died for him and that He alone was the answer to his two greatest problems, sin and death. He was uninterested and did not want to be baptized after all. Another time I spoke with a young couple who wanted to be baptized. When I asked them why they gave puzzling and rambling answers. I told them the good news the best I knew how and they seemed unaffected but still wanted to be baptized. Against my better judgement I baptized them and soon they were fighting like to angry cats, sleeping around, doing drugs and in general acting like sinners do. Read Acts chapter 2 and following. Peter and the others were not preaching the church of Christ, or moral improvement, or water baptism, they were preaching the good news about what Jesus by his living, dying, and resurrection had accomplished for sinners. After Peter’s great gospel message the hearers cried out with convicted hearts “What must we do?” Do we do that? We should. We should preach Christ, explaining how he paid for our sins by offering himself as a sacrifice and absorbing God’s wrath against sin. We must not only preach the facts of the gospel of Christ but what those facts mean! In my view we should teach people the gospel and then shut up. If God grips their hearts and opens the eyes of their understanding they too will ask “What must we do?”. Then is the time to tell them about baptism and the disciplines of following Jesus. I’m not saying we should never mention baptism to a lost person but it should not be presented as the Savior instead of Jesus. Why are some churches growing? There are a variety of reasons why some congregations are increasing in numbers. Churches in large metro areas like Dallas or Charlotte of some other large population center will have many families because they are simply there. Let me ask another way. Why are there scores of transformed lives in some churches? Why are addicts and convicts and unfaithful husbands and all sorts of former sinners now happily following Jesus and telling others about what He has done in their lives? I promise you it is not because the music is better, or guests are greeted with coffee and doughnuts and …..you get the picture don’t you? Churches that never get far from the gospel are very likely to grow. Our purpose should be to preach and teach Christ, to make him known far and wide. Our ministry to our members should be to help one another to know him more, to love him more deeply, and to delight in Him as our only hope of a future. Our music should be gospel saturated, Christ centered. The cross of Christ should get far more press than the church of Christ. Men and women are not reconciled to God by what they do but by the blood of Jesus alone. Our members should know these things and know them well. Paul said of the gospel that it is the “power” of God. The telling of what Jesus has done for sinners is it’s self the dynamite of God to blast into the most rebellious hearts. And he said the gospel of Jesus is of “first importance”. That means that every other thing in church life, no matter how good is is not as important and as necessary as the gospel. We must keep the most important thing the most important thing! I suggest you preachers do a series on Jesus! Teach the gospel for several months, every Sunday. Better presentations, better programs, better books, and better looks are no substitute for the story of Jesus loving sinners so that he died for them. The gospel is just as important for our sanctification as for our initial salvation and it is because of the gospel that we will one grand day know glorification. Don’t neglect the good news about Jesus! Churches that do not keep the gospel of Jesus first should not expect to be a church that grows. Maybe the title of this article should be, “The confessions of a combat veteran of life, and following Jesus, and some of his failures”. Or perhaps something like, “Why would a slightly Pentecostal, mostly Reformed, staunchly independent person with a Baptist background continue to worship in a Church of Christ? Why do I stay you ask? First, how I got here. I was born a poor white kid in the mountains of Western North Carolina to a small time tobacco farmer and his wife in the summer of 1945. My dad was one of 13 children raised mostly in the wilderness areas in Yancey County, N.C. There was no talk of God or of faith or church from his branch of the family. They were not bad people as people go, but not people of faith. My father had been attending church some (maybe just to see his future wife…) My mother on the other hand had a solid ancestry of believers for generations. Mom came to faith at the age of 8 and was immersed at the age of 12 and was not happy she had to wait four years. In my youth we had only attended church perhaps less than a dozen times by the time I was a teenager. I rode a bus to vacation Bible school some, built a bird house or two, but all I knew about God was what I had learned from observing my mother’s life and my father’s strict morality that I subconsciously attributed to God. At the age of 15 I was drafted into God’s Army. I was not looking for God or a better life, I was looking for longer cigarette butts, fast cars, a free beer, and average and up girls. A cousin’s husband invited me to sit at his kitchen table and for the first time I remember hearing it, he told me the very good news. I can remember like it was yesterday how convicted and convinced I was that I must turn to Christ. The next day, on a Sunday, I went to church and when the invitation was given I made the long walk from the back of the church to the altar area and there I prayed begging God to forgive me and stood before those people and pledged my life to Jesus Christ. A few months later, at the very first opportunity, I was baptized in the chilly waters of the North Fork River in Buncombe County, N.C. I took liberty time on the outskirts of Sodom and Gomorrah a few times and when I was eighteen I battled for my very life in the Valley of the Shadow of Death. God was there! At about 21 I reenlisted and volunteered for infantry duty. I received my basic training at Fruitland Baptist Bible Institute and started preaching every place I could find ears. I disagreed with my Bible professors, my pastors, and my closest friends about what, in my tender years I presumed to be legalism, and rejected it outright. I thought differently than almost all of my peers and said so. The pattern has not changed much. I am a combat vet of the darkness of rejection and divorce, and of the ugly hand of death. I have navigated through the storms and tangles of the jungles of life when at times my only companion was the Holy Spirit even when some of the messes I found myself in were of my own making. I did a short stint as a mindless Christian robot whose only job was to find fault with others in the same Army, and by doing so, to try to elevate my rank. Finally, in the providence of God, the One who is Patience helped my to see Jesus Christ with the goggles of error, sin, and self righteousness off, and it seemed for the very first time I knew what the rest of the righteous meant. I believe my hunger for truth was a gift from God so for many years as I have followed sometimes well and sometimes not so well, at almost 66 years I am striving to grow in the grace and knowledge of Jesus. Over a decade ago two widowers met and I was one of them. In 1999 I married Carol whose daddy was a church of Christ preacher. His family and her mother’s back to Adam were all church of Christ. I loved Carol and she loved me and we both were convinced that God had brought us together. The problem was that she disliked my little Baptist church and I didn’t appreciate her progressive church of Christ. So, God solved the problem by having us move from the DFW area to Monroe, LA where we would devote much of the next decade to fairly new twin grandsons and their big brother. At the invitation of my new next door neighbor the first church we visited was Whites Ferry Road Church of Christ in West Monroe, Louisiana. I had already decided that our new church home would not be a church of Christ but, the Commander in Chief had other plans. Within the first 3 or 4 minutes after I walked into the building at WFR I had my answer from God that I was home. I have not been disappointed. Do I agree with everything taught there? No. So what? These are a few reasons why I stay. Gospel centered! I live with and love with people who understand what Christ has accomplished for sinners and make much about Him! I doubt that you could find a phone booth full of folks out of our forever family who think they will be saved because they are good enough. On the side of the pulpit facing the preacher this is carved into the wood. “It’s not about me”. I stay because I like being with people who keep the main thing the main thing. Global vision! Our troops go into the highways and hedges after sinners and to the ends of the earth with the good news that Jesus has made a way out of sin and a way to “get out alive” as one of our elders says. Recovery ministry, counseling, men’s groups, women’s groups, global relief ministry, world-wide radio ministry, church planting, missions to dozens of foreign countries, etc. are the norm. And as men get old and retire or relocate to glory, young men cut from the cloth of their predecessors are visionaries who see no limit to what God can do through the power of the Holy Spirit and the people of WFR Church. I stay because I approve of this sort of missional outlook. It’s Home! It’s my family! Why would I even consider leaving? I have been invited by a few online zealots to leave, called a Satanist, and a few other things because I sometimes too loudly reject their fire-breathing self-righteous legalism and sectarianism. I’m light years away from being all I’d like to be but I am a sibling with a seat at the table. I feel welcome here, I enjoy the company of this totally odd bunch I’m on my way to heaven with. It might surprise you to know that to the last one, all of our leaders readily admit that they too are about like me. Just sinners saved by grace who still mess up but never give up. I am led and mentored by people who are still hungry to grow, to learn, and to love Christ and our fellow-men even more. I’m staying, count on it!